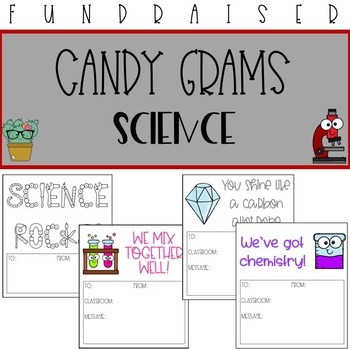 These candy grams are science themed and perfect for your science class, science club, student council, PTA/PTO/PTSO, or other fundraiser at your school! These designs are full of science themed clipart, including quartz, beakers, light bulbs, flies, and more. There are 20 different designs. 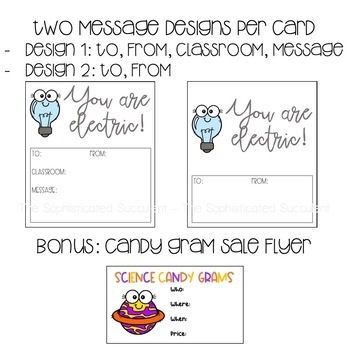 There are two blank bonus templates included for students to design their own candy grams, if you wish. All designs come in a color version and a printer friendly version. Additionally, there are 2 different templates provided when writing messages. 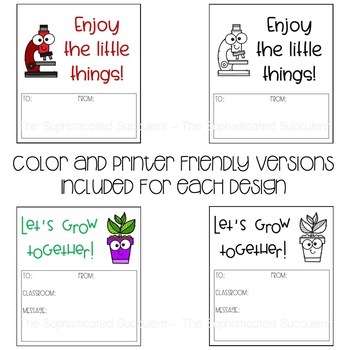 One design includes spots to write for: to, from, classroom, and message. The other design includes spots to write for: to, from. 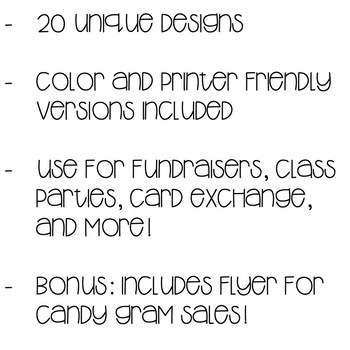 Bonus: A candy gram flyer is included to assist with sales. Preview the thumbnails to take a look! - We have a great bond! - You make the world a brighter place! - You are out of this world! - I've had my eye on you! - You make me feel bubbly! Print these off and include a treat for a unique fundraiser or class party! There are two candy grams per page. Looking for other Candy Grams?